Blatant evil can easily be spotted within the pages of zombie and vampire books. But sometimes evil is vague and blurred. Although we find no flagrant blood-sucking sort of evil in Jane Austen’s stories, a more subtle kind is very much present. It sits there; finely dressed; fangless; but monstrous in word and action. Last week, I spent the early part of my day in the company of fellow Janeites (including several males!) at a local JASNA meeting discussing Jane Austen’s Mansfield Park. We began by reading the first chapter. Within the first three pages of the book, Mrs. Norris makes several calculated moves that drastically affect the lives of other relations. I didn’t realize how genuinely evil she was until I’d re-read the book and listened to this fine group of astute-Austen-enthusiasts (say that three times fast) pick apart her words (and Jane can say so much with just a single word) ever so carefully. In short, Mrs. Norris is wicked. Without going into particulars, Mrs. Norris (J.K. Rowling named Argus Filch’s cat after this character) manipulates people with no motive other than to inflict pain. She starts with her own sister and then turns her attention to young Fanny. Manipulation, old-fashioned manipulation, occurs often in Jane Austen’s characters. We see it in Isabella Thorpe throughout Northanger Abbey as she uses the art of manipulation on Catherine. Isabella’s intentions, however, are not so sinister as to inflict pain. She is simply trying to bring her rather uncouth brother and Catherine together. She’s good at what she does. She is practiced at the art of manipulation. Mary Crawford, in Mansfield Park, is the queen of manipulation. She too, is eager to help her flirty brother; and let’s face it, she’s out for herself. But, I wouldn’t label her as evil. In fact, when she is kind to Fanny, I love Mary Crawford! It’s hard not to like her. The only other barefaced evil character in Austen’s books (other than Mrs. Norris) is perhaps General Tilney in Northanger Abbey. Why? He sends Catherine home on the post-chaise; a 70-mile journey; with no servant; exposing the poor girl to the cruel elements of nature and all sorts of potential danger. Why? I wonder if Jane Austen considered General Tilney to be on the same evil level as Mrs. Norris. What do you think? 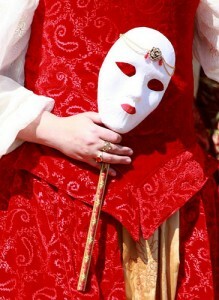 *Photo: Red Baroness with her Carnivale mask by Alaskan Dude, obtained through Flickr. Who’s the Dreamiest Austen Hero?